"Our aim is to provide a professional, affordable and friendly service that delights our customers every time." 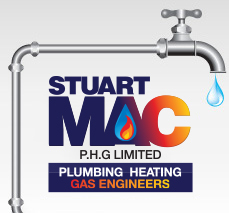 STUART MAC PHG provides a complete Gas service to ensure that you get the most efficient safe performance from your gas appliances. We use the latest specialist Gas Analyser’s to with written reports for all services / work carried out ensures that you receive only the best service. As a landlord you will be well aware of the legal requirement to have the gas appliances serviced regularly servicing your appliance is not just about looking it over or connecting your pc. It all looks good but if your appliances are not opened cleaned and vital checks of the gas pressures and flame pictures then your service could have been a waste of time and leave you with a dangerous appliance. We utilise the latest Gas Analysers we ensure that not only do we clean your appliance in the correct manor we check both the supply to your appliance but ensure that the working and burner pressures are correct. We supply a written landlord certificate of the service including test results. We also provide a reminder and call out service to Landlords who have their gas appliances serviced by us. Give us a call to find out more. We provide a quick response service for our Landlord accounts either to carry out repairs or replacement of plumbed items. We provide a quick response service for our landlord accounts to install either gas or plumbed items either to meet preparations for new tenants or to meet other obligations. We can carry out repairs from replacing leaking taps / to broken appliances, we operate to agreed cost levels with our landlord accounts. We provide certificates for all work either gas / water or electrical work to ensure you remain compliant with your legal obligations. All of our engineers are part P qualified which reduced time and costs to you in getting a fully qualified electrician when replacing or installing new for old equipment. We provide 24 / 7 priority call out services with no call out charge for our landlord accounts. Conditions apply. •	Manage services with your Tennant’s by agreement. • Boiler / Heating design services to keep your costs down ensuring no over sizing. We understand that keeping costs down is important to maintain profitability but reliable cost effective safe appliances to delight your customers. We are able to advise and install the correct products to meet your needs. Over sizing of heating systems boilers , radiators is not uncommon this all costs money that is better in your pocket than sat in a property providing no additional benefit to either you or your tenant. We off design and sizing services please see heating for more information. As a landlord, you're responsible for the safety of your tenants. Your duties apply to appliances & flues in occupied residential properties. You must ensure that appliances are working correctly and guard against the dangers of carbon monoxide. • Gas appliances should not be placed in sleeping accommodation areas or cellars.